Put 5-6 tablespoons of sugar in a small saucepan, melt it on low heat until it gets a nice amber color. 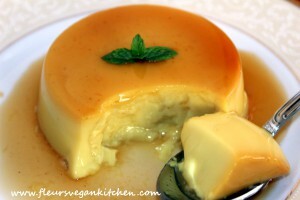 Pour it into the forms so that you get a layer of 3-4 mm of caramel. Dissolve the agar-agar in a little bit soy milk. 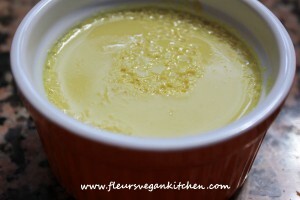 Mix the remaining soy milk with the vanilla sugar and turmeric. Stir until the sugar has dissolved, bring to a boil then add the agar-agar and cook for 2 minutes. Pour into the forms, over the caramelized sugar. Consume it directly or keep it in the refrigerator, in forms, until the next day. Note: for more servings you can prepare one big crème caramel, in a large form adjusting the quantities to the the size of the form. Follow the prescribed amount of agar-agar otherwise it can harden too much. Creat de: fleur laSaturday November 8th, 2014.la08:49 AM. Multumesc mult, Gabriela! 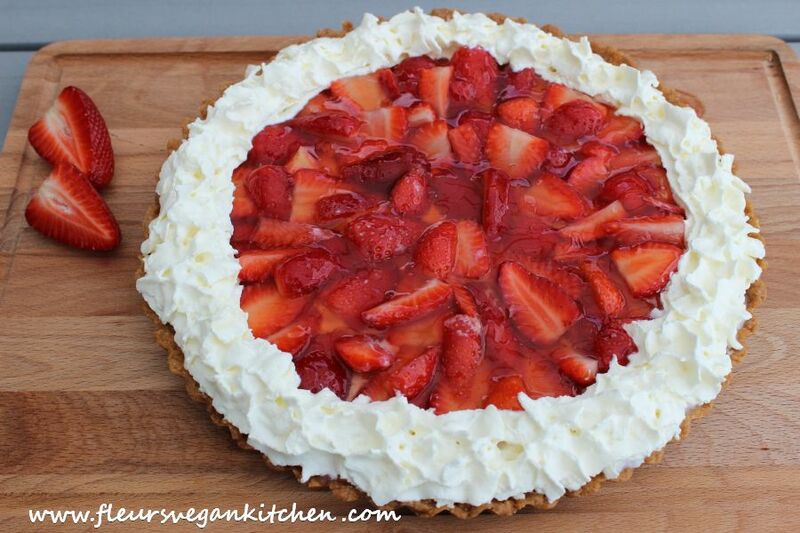 Totul se poate prepara si vegan, este mai delicious, mai sanatos si nu e nevoie sa chinuim nicio fiinta!